The biggest fights that could be made lost their luster on Saturday, but that doesn’t mean that the fans didn’t get an epic night in exchange. Now, with two epic upsets in the books, we look forward toward what is next for Conor McGregor, Nate Diaz and the rest of the night’s stars. The irony is that the villain of the UFC is far from over despite being vanquished in brutal fashion. Conor McGregor’s shots did more damage than most expected when the fight was announced at 170. In fact, plenty of fighters have failed to make Diaz that bloody in three rounds as McGregor managed to do in a round and a half. McGregor relied nearly exclusively on the big left hand. For as many times as he was reaching and whiffed through the air, he was successful. The evidence was on Diaz face at the press conference. Almost comically, the right side was cut and bruised while the left was nearly completely clean. Diaz’s physical advantages were simply too much for McGregor. Would he have had a deep enough gas tank to go five-rounds on short notice? It doesn’t matter. His reach and hand speed were enough to pepper McGregor from a distance before finally rocking the Irishman with a big shot. From there, it was routine for the Stockton native as “The Notorious” was reversed on a desperate take-down attempt. When Diaz wrapped his arm under the chin, it was clear on McGregor’s face that he knew the fight was over. Where the two go now is unclear for both fighters. I’ll begin with Diaz since his is the least complicated of the two. Diaz is ranked fifth in the rankings. While he carries a lot of momentum on his side now, he is only two fights removed from a one-sided loss to champion Rafael dos Anjos. It is more than likely that he faces top contender Eddie Alvarez or the winner of the upcoming Khabib Nurmagomedov-Tony Ferguson match-up. Either bout would be a tough test for Diaz but would prove that he is ready for a rematch with RDA if he remains the champion. The big mystery is what the future holds for Conor McGregor. For as much bluster as “The Notorious” brought into the fight, I feel he did himself in when he allowed Diaz to fight at 170. For as much damage as Diaz took, it’s hard to imagine him having the same performance if he had to spend the 11 days depleting himself to make weight rather than what can be assumed was a simple cut to make 170. As much as I feel it could still be a competitive fight—which is a testament to McGregor’s performance at welterweight—a unification fight with RDA is likely off the table. 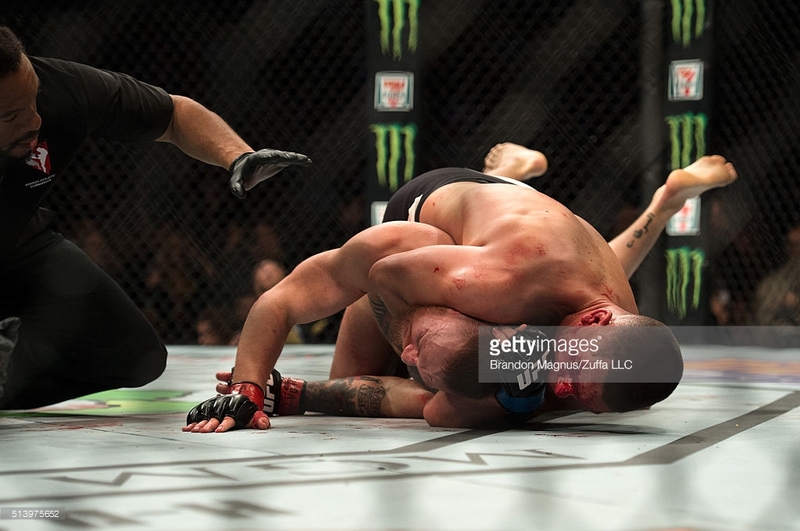 It is simply hard to imagine the UFC promoting that kind of history making fight knowing millions saw McGregor be taken out in brutal fashion. He is still the champion of the featherweight division. More than likely, McGregor will face one of the featherweight division’s elite rather than a division hopping bout. The next fighter in line, logically, is Frankie Edgar. As straight-forward as that sounds, Dana White appears to have other plans. Even on national television with Edgar next to him on the post-fight show, White refused to commit to “The Answer” being next for McGregor if he returned to 145. Instead, it seems as if former champion José Aldo is a frontrunner for a rematch with the Irishman. Edgar is overdue for a shot at the belt, that much is certain. But, the fact remains that he is not seen as a pay-per-view star. The UFC would stand to make more money by having McGregor face Aldo or RDA rather than Edgar. Edgar in many ways is in a position similar to flyweight champion Demetrious Johnson. Johnson is one of the elite talents of the UFC. However, his pay-per-view numbers on his own have been so paltry that he is nearly exclusively relegated to cable or network television fights. Even when he is on pay-per-view, his bout is always second billing to another bigger star. In the last two years Edgar has headlined four UFC cards. All of them have been on the cable network Fox Sports 1. The organization is putting together UFC 200 for this summer and is promoting it as the biggest event in their history. With Ronda Rousey claiming she will not be ready, one assumes that they plan to put in their next biggest star in McGregor as the headliner. For an event as big as they are making it out to be, Edgar could easily be passed over again in favor of a bigger pay-per-view attraction like Aldo. Combat sports are an interesting business. Mike Tyson, Lennow Lewis, and Manny Pacquiao all suffered losses amidst dominant runs, but their status as pay-per-view draws did not drip so much that they did not recover with their consecutive bouts. Conor McGregor must now respond with a victory in his next outing, likely in front of the biggest audience ever in MMA history. If he succeeds, talk of history making bouts are all back on the table again. Should he lose, it may well begin to pull the curtain down on the captivating show he’s put on.